INFORMATION ALWAYS UP TO DATE WITH PARATUS SYNC It is a great advantage to have all the object information emergency service personnel are likely to need on board the vehicle already. This removes dependence on the presence of radio network coverage when access to critical information is needed. But the distance between the forward planning department and operative department can be substantial. Not just in terms of geographical distance (with different stations in different places), but also in the sense of system separation - that the information may be held in different kinds of system which cannot exchange information. 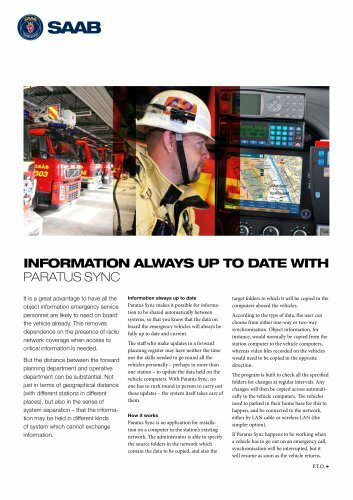 Information always up to date Paratus Sync makes it possible for information to be shared automatically between systems, so that you know that the data on board the emergency vehicles will always be fully up to date and current. The staff who make updates in a forward planning register may have neither the time nor the skills needed to go round all the vehicles personally - perhaps in more than one station - to update the data held on the vehicle computers. With Paratus Sync, no one has to rush round in person to carry out these updates - the system itself takes care of them. How it works Paratus Sync is an application for installation on a computer in the station’s existing network. The administrator is able to specify the source folders in the network which contain the data to be copied, and also the target folders to which it will be copied in the computers aboard the vehicles. According to the type of data, the user can choose from either one-way or two-way synchronisation. Object information, for instance, would normally be copied from the station computer to the vehicle computers, whereas video files recorded on the vehicles would need to be copied in the opposite direction. The program is built to check all the specified folders for changes at regular intervals. Any changes will then be copied across automatically to the vehicle computers. The vehicles need to parked in their home base for this to happen, and be connected to the network, either by LAN cable or wireless LAN (the simpler option). If Paratus Sync happens to be working when a vehicle has to go out on an emergency call, synchronisation will be interrupted, but it will resume as soon as the vehicle returns.